Wondering how to celebrate Valentine’s Day this year? Well, wonder no more. 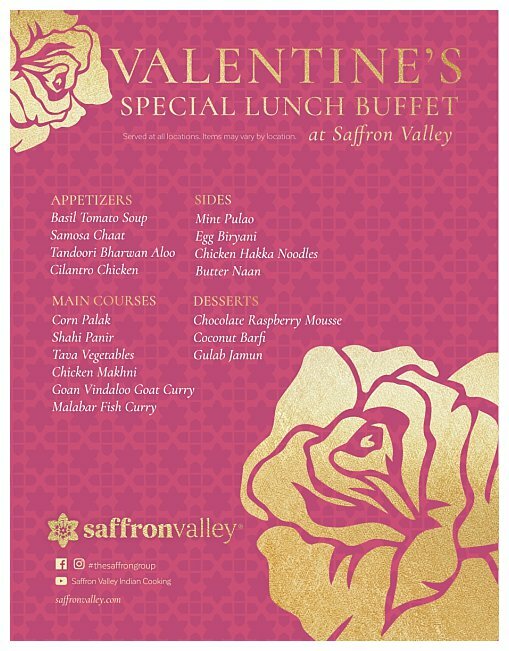 We’ve got you covered at Saffron Valley. Bring your sweetheart for a special Valentine’s Day buffet that includes appetizers, sides, a main course and dessert. We’re featuring appetizers like Samosa Chaat, Cilantro Chicken and Tandoori Bharwan Aloo in addition to sides such as Butter Naan, Mint Pulao and Egg Biryani. At this special buffet, you and your sweetie can dish up Chicken Makhni, Malabar Fish Curry or Corn Palak for your main course. Pair your meal with a cold soft drink or one of our signature chais. For Valentine’s Day, it's almost a requirement to enjoy a dessert even if you share it with your beloved. The dessert options are Gulab Jamun, Coconut Barfi and Chocolate Raspberry Mousse. This is a holiday for sweethearts. Your Valentine’s Day is sure to be a memorable one when you celebrate it here with us.